Matt Damon and Jodie Foster star in “District 9” director Neill Blomkamp’s latest politically tinged sci-fi feature, about a factory worker’s attempt to hijack his way onto a space station inhabited by the elite. A politically charged flight of speculative fiction makes an exciting launch, only to tailspin into an ungainly crash landing in Elysium. Coming in the wake of After Earth and White House Down, this marks Sony’s third big-budget disappointment of the summer, the problems this time stemming from deflating final-act script problems that one would think could have been easily identified. Like Neill Blomkamp’s out-of-nowhere sci-fi triumph with District 9 four years back, this one puts rugged action and convincing visual effects at the service of a sociologically pointed haves-and-have-nots storyline, but when the air goes out of this balloon, it goes fast. There will no doubt be partisans, but an embrace by the masses will elude it. Blomkamp gets the dystopian juices flowing with images of future sprawling slums and urban ruin that one might initially take to be Mexico City or Sao Paulo but are soon identified as belonging to Los Angeles in 2154. Most of the beleaguered inhabitants seem to speak Spanish and perform menial labor if they do anything at all, while good health care is very difficult to come by. 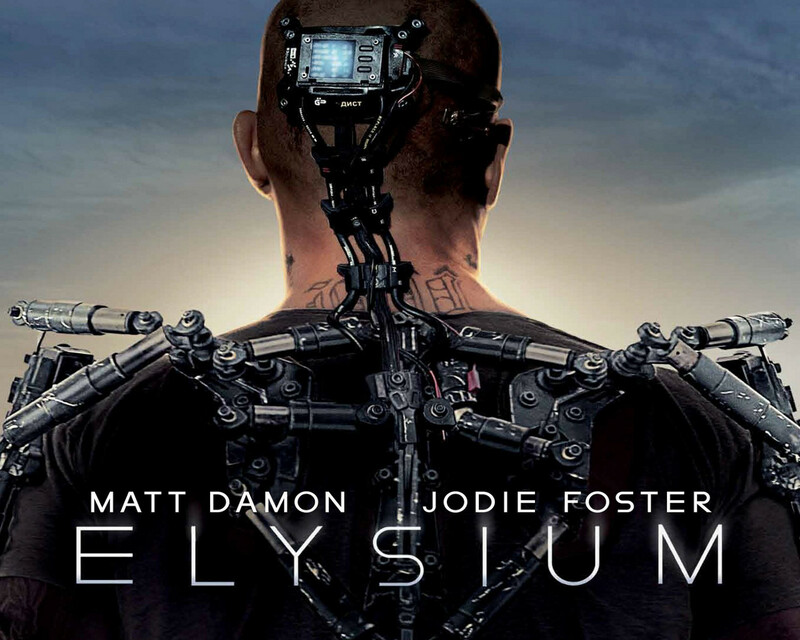 By contrast, hovering far above Earth and appearing like a five-spoked wheel in the sky is Elysium, an enormous space station where the rich live in a stress-free country-club environment enhanced by marvelous technology that can cure any ailment, meaning that life can theoretically go on indefinitely. A kind of United Nations council of international fat cats runs the place, and riffraff from the overpopulated and polluted planet visible beneath them is rigorously kept out, no matter how many desperate refugees dare the 19-minute dash in makeshift spacecrafts in order to get their illnesses treated. Liberals may embrace the film and conservatives might attack it strictly on the reductive basis of its obvious plea for universal health care. All the same, the growing contemporary disparity between the privileged classes and the poor in many parts of the world is plausibly extended for dramatic effect in Blomkamp’s script, which has the wretched Earth dwellers kept in line by robo-cops and where anyone who actually has a job is counted as lucky. Among these is former convict Max (Matt Damon), now holding down a lowly factory gig but maintaining ties with the criminal/revolutionary underworld, part of which is devoted to running “illegals” up to the spinning celestial orb. Much in the manner of District 9, but without the aliens, this early stretch creates a potently physical impression of a dangerous and destitute urban environment, one where immediate threats could lurk anywhere and a sense of one’s physical and societal inferiority can never be escaped; all one has to do is look up. With all this, Blomkamp sets several narrative pots to simmering, promising much in the way of eventual direct conflict and potential intellectual complexity. Instead, the film narrows into a series of standard gun battles, explosions, mad dashes, close calls, tough-guy fisticuffs, ridiculously fast downloading of massive computer files under maximum duress and, in the end, mawkish sentimentality. All the interest and goodwill built up by the sharply conceived preliminaries is washed away in a succession of scenes that feel crushingly routine and generic, not to mention guided by ideological urges. Contaminated in the workplace by radioactivity that leaves him with five days to live, Max is convinced by his insurrectionist gangland pal Spider (Wagner Moura) to be painfully fitted with a metal exoskeleton that will turn him into a veritable robo-rebel, an abundantly armed knight of the righteous. In an unusually contemporaneous twist, they intend to capture Elysian pioneer (William Fichtner) and transfer the central organizational file from his head into Max’s, which they believe will open up the Elysian gates to the masses. Trying to orchestrate a coup for her own interests is Armani-clad regime iron lady Delacourt (Jodie Foster), who has an Earthbound stealth agent, Kruger (Sharlto Copley), to do her dirty work. Unfortunately, Kruger all but hijacks the film in the late-going with his irrational behavior and cackling his sword-twirling villainy comes off as something more appropriate for a live-action cartoon bad guy, or an enemy in a 300-like bloodbath. Not helping is Copley’s unsoftened South African accent, which makes much of his dialogue very difficult to decipher, even if the character’s intent remains unmistakable. Max’s transformation into a part-metal fighting machine may have been conceived as a noble act of self-sacrifice, an existential act or both, but dramatically it has a highly constricting effect on his behavior, as well as on the viewer’s ability or desire to relate to him. Bereft of full mobility and reduced, in effect, to a simple fighting machine, the character loses his unpredictability along with much of his appeal. Had the climactic action been pitched in a less ordinary way, Max could have emerged as a genuine tragic hero, but the character’s full potential is missed by a long shot. Conceptually as well, Blomkamp has failed to take the extra step with both the ruling class and the denizens of the lower depths; despite the fact that the action is set 131 years hence, both look exactly as they do now. 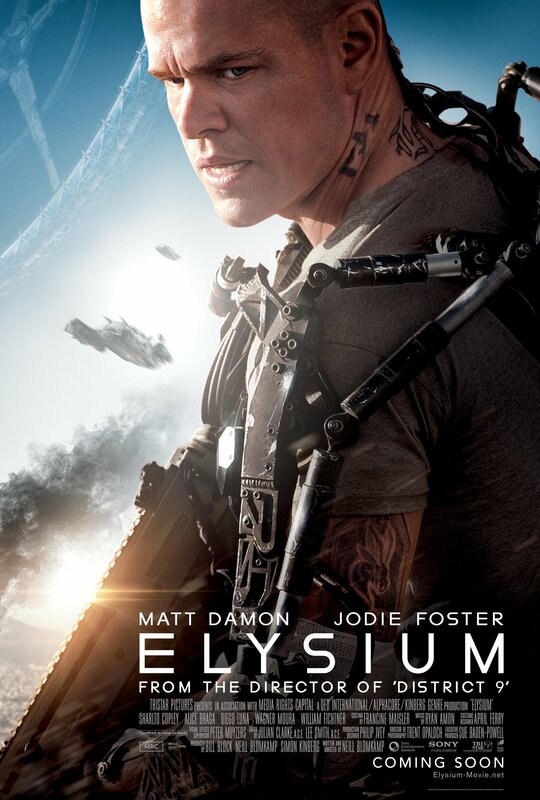 The fancy mansions of Elysium and their inhabitants’ wardrobes are exactly what you’d find in Malibu or Miami today, while the rough-hewn down-and-outers sport tats and attitude and would look right at home in a Fast and Furious film. With his noggin shaved, Damon comes off credibly as a ticking time bomb early on but becomes unduly constrained by his metal apparatus later. Foster is all official business and ambition as the devious politician, often speaking French to her colleagues and then English in a firm international accent of sorts. Alice Braga plays for empathy as a single mother with a leukemia-stricken little daughter for whom a trip to Elysium represents the final hope. 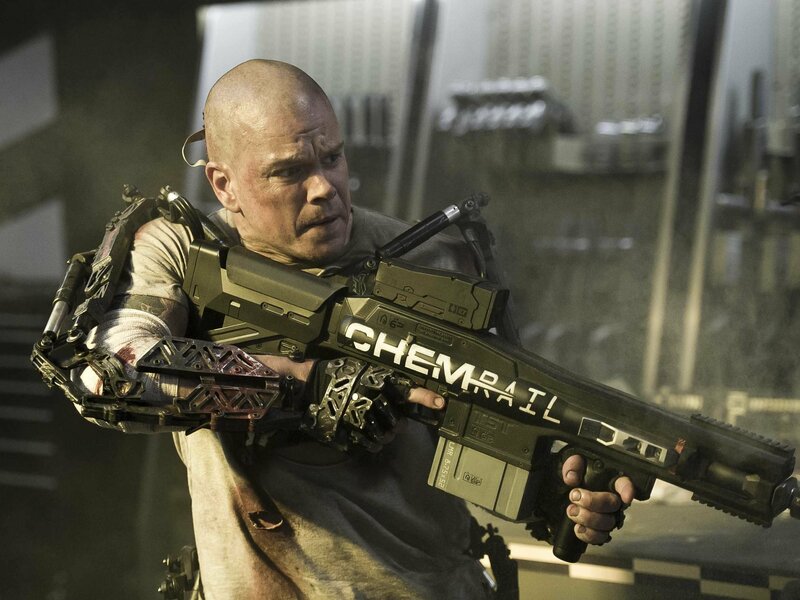 As in District 9, the excellent effects and location work (Mexico City stood in for Los Angeles, while Vancouver represented aspects of Elysium) make for a vivid, convincing backdrop.